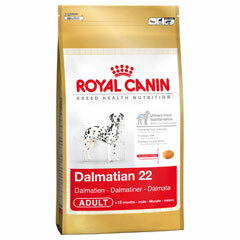 Royal Canin Dalmatian 22 has been specially formulated with low levels of purines to help moderate the excretion of uric acid in the urine and thus reduce the risk of urinary stones forming. The patented complex of B group vitamins and a specific amino acid helps reinforce the skin's barrier role and helps reduce cutaneous dehydration. The addition of vitmain A helps regulate epidermal growth and production of sebum, while EPA and DHA help further support the skin. With a complex of taurine, L-carnitine and omega 3 fatty acids, Dalmatian 22 helps support good heart muscle function while providing your dog with first-rate nutrition.